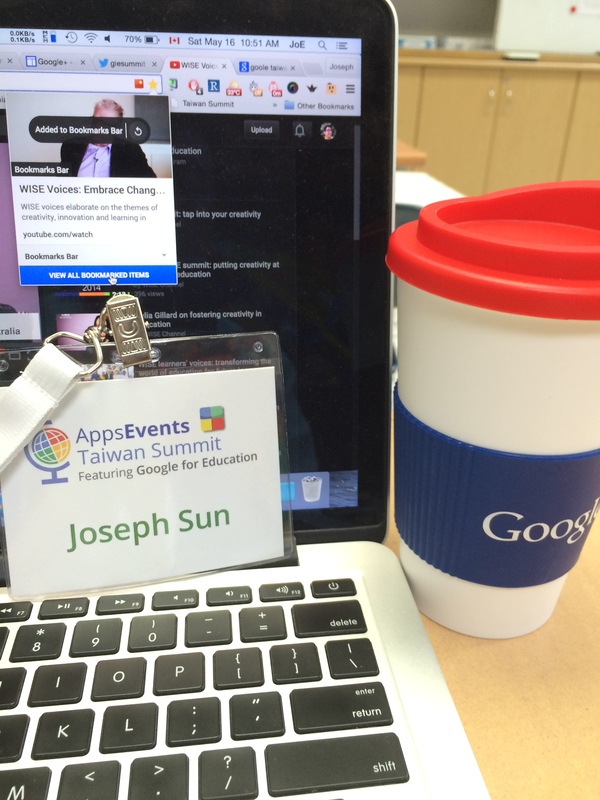 #GIESummit – time to google it up! Last weekend I had the privilege of attending a work-sponsored Google Apps for Education workshop on using technology in the classroom. Let me start off by saying this whole work-sponsored PD is new to me and I gotta say I love it! Registration, food, transportation, and accommodation are all reimbursed from a personal PD budget. I could only imagine how much better business executives have it, but I’ll take what I can get. Getting out of the city by hopping on the HSR is always enjoyable. The workshop is held at Morrison Academy in Taichung. They’ve got such a nice campus – open courtyard, very American feel to it. With the blazing hot sun in Taichung, it set the mood for an energetic weekend. The two-day workshop offered a myriad of topics by speakers from the US, Thailand, HK, and many other places. My favorite speaker from day 1 was Wes Przybylski. Lively and energetic, he modelled a truly individualized, blended-learning environment that so few educational speakers seem to get. One of the biggest things that get on my nerves is when educational speakers talks about innovating education by lecturing for hours. The irony does not seem to dawn on them. But not Wes – his workshop consisted of multiple live google forms that gathered feedback and content created by the attendees. We were shown how to use tools to record, edit, and publish videos for flipped learning straight from Youtube. And we were given time in class to do just that. Hands on and collaborative learning with technology, it doesn’t get much better than that. My favorite workshop from Day 2 was delivered by Ed Chang, a teacher from Chinese International School in HK. By the second day, it was clear people were more relaxed and less-eager than the first day. Perhaps the social mingler at TGIF the night before had taken a toll on everyone’s collective morale. Ed talked about using digital as well as analog (pen and paper) tools for teaching writing. Actual hand writing is used in the brainstorming and draft stage, while digital tools are used to edit, incorporate pictures, and publish the final products. To me, he seems to have struck the perfect balance between what can be construed as two opposing pedagogical tools. All in all, I was shown all sorts of different hacks within Google products like Gmail, Youtube, Google doc. There are so many extensions within Chrome that can do crazy things to make your day even more productive. I think I would have stumbled upon these neat tricks one way or another, but the workshop showed me what is available out there and where to look for it. Maybe I’ll even take the basic course to become an Google Educator – just a formalized way of telling prospective employers that I have sufficient knowledge of Google apps and know how to use them in the classroom setting. More on that later. ← Tears, joy, and the use of Kahoot for learning!